This program is designed for someone new to digital photography, someone that wants to know more about the operation of their camera, and also those that have some knowledge, but are looking to expand their knowledge / approach of using a camera for personal expression. Learn how to use your camera in this creative, fun and interactive photography class at Lens Work. 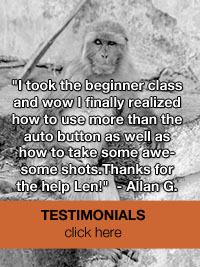 The four classes are designed to teach you the fundamentals of digital photography. Discover how to use f-stops and shutter speeds to take better photographs. We’ll also discuss composition,editing and imaginative approaches to photography to spark your creativity. Much more 'in-depth' than the crash course/weekend bootcamp, and a great way to create new friendships as well as 'synthesize' all the material that is presented. Emphasis is on acquiring knowledge of the manual operation of the camera, becoming proficient in the craft while working to evolve a uniquely personal photographic vision. You will be expected to be an active participant in the class. There will be various lessons, tutorials, slide talks, demonstrations and group critiques to support the technical information you receive. In classroom instruction is balanced with outdoor shooting for a well-rounded, fun and informative experience. There will be in class 'review' of the various homework assignments as well as helpful tips in digital editing of your photos. • Introductions. The different types / designs of digital cameras and how to best utilize them. • "We don't 'take' photos', we 'make' photos." Some ideas and insights for using a digital camera for personal expression. • Understanding the SHUTTER. Shooting for less 'movement blur'. • "What are all those numbers and dials?" A simple, elegant approach to understanding the measurements and settings of your camera. • EXPOSURE. Not too hot..not too cold. Easy ways to get it just right. • COMPOSITION. Insights, ideas and simple techniques to create more dynamic images. • DEPTH OF FIELD and LIGHT SENSITIVITY. More in depth to these two keys functions of ANY digital camera. • DIGITAL EDITING. A presentation of some of the ideas, software and more importantly..an approach to how we can 'refine' our images with editing. Cost : $150 ( To purchase please contact us (for Interac Email payment & save HST) or go our STORE for paying with CC. "Having participated in the weekend bootcamp, I am now really enjoying the week in between classes to integrate the information" - JODY C.